This book will appeal to the general public as well as practitioners of psychiatry, medicine and health care. It is written in a very straightforward style that is easy to understand. It provides the reader with a great deal of insight into the causes of depression and offers practical answers in order to overcome it. The author presents evidence, in the form of a number of case studies, that bio-energetic therapy can be effective in relieving depression. Regardless of psychiatric diagnosis or classification, it would appear that depressed patients who have a history of suppressed or repressed anger; owing to either current or historical trauma; profit from bio-energetic therapy. It is not claimed that this therapy is useful or appropriate for all depressed individuals and no claims for or against the effectiveness of other forms of therapy are intended. Pragmatically speaking, bio-energetic therapy should be viewed as a therapeutic tool to be added to the treatment programme of many depressed patients. It is not necessary or desirable to view bio-energetic therapy as a type of therapy which should be done in isolation from other treatments. In most cases, there is no reason why bio-energetic therapy should not be conducted in conjunction with certain simultaneous therapies such as marriage counselling and pharmacotherapy. Dr. Goyeche is a Fellow of the International College of Psychosomatic Medicine, a member of the Canadian Society of Clinical Hypnosis and a member of the International Institute for Bio-Energetic Analysis. He is very well qualified to show you how bio-energetic therapy can be used to overcome sadness, fear and anger in this very interesting and informative book: Winning Over Depression. Chapter 1 - What is Depression? 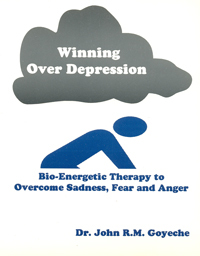 Winning Over Depression: Bio-Energetic Therapy to Overcome Sadness, Fear and Anger by: Dr. John R.M. Goyeche; 130 pages; ISBN 978-1-55270-051-8; softcover; published in 2000; Canadian $24.95.